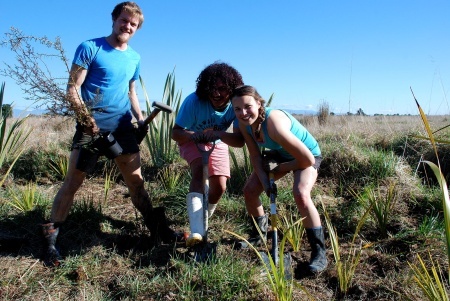 Living Legends planted a total of 6,700 native trees in the Wakapuaka Wildlife Reserve. The Wakapuaka area, located at the head of the Haven Estuary adjoining the Boulder Bank north of Nelson, is a valuable ecological and recreational resource and is a prominent feature seen by those arriving in Nelson via State Highway 6. The area where Living Legends has planted is focused around the Department of Conservation administered Wakapuaka Wildlife Reserve. The Haven Estuary is of national importance as a major feeding area and roost for wading birds and regionally important as a nursery and feeding area for fish. The Boulder Bank is internationally recognised and is a fragile and ecologically unique feature. The Tasman Rugby Legend is the legendary former All Black captain and former Director of Rugby at the Tasman RFU, Todd Blackadder. Todd played for the All Blacks 25 times, including 14 as captain. 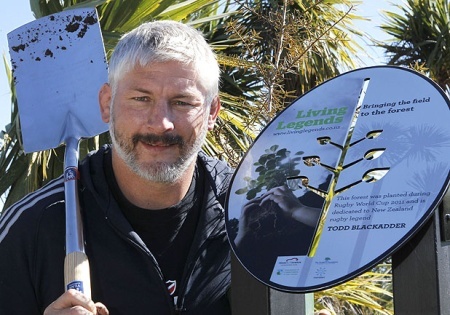 Todd Blackadder acquired folk hero status, especially in Canterbury, while leading the province and the Crusaders to a remarkable period of success in the national championship and in the Super 12 from the late 90s to the early 2000s. Todd achieved mighty deeds in New Zealand rugby and epitomised, with his devotion to any team for which he played, at club, provincial and international levels, all of rugby’s best values. Though a product of North Canterbury, Blackadder first emerged in rugby while working on a farm near Collingwood at the top of the South Island. He represented Nelson Bays as a teenager in 1990 and from that union received an early break in a New Zealand Divisional XV on a tour of Australia in 1991. He returned to Canterbury in 1991 for the first of more than 100 games for his home province. After appearing for national sides at colts, sevens and on the development tour of Argentina in 1994, Todd made the All Black side which toured Italy and France in 1995. In the 1994-95 seasons he had confirmed himself as a splendid all purpose forward with the Canterbury in the Ranfurly Shield successes of those seasons. Todd was again an All Black on the 1996 tour of South Africa and by now his considerable leadership qualities were being recognised. By 1997 he was captaining both Canterbury and the Crusaders and on that year’s tour of England, Wales and Ireland he was the All Blacks’ midweek captain. Back in New Zealand, Blackadder in 2006 took up a position as Director of Rugby at the Tasman RFU, an amalgamation of the Nelson Bays and Marlborough Unions. Todd is currently the Head Coach for the Canterbury Crusaders.